1975 was a great year for movies. Jaws. Three Days of the Condor. Deep Red. 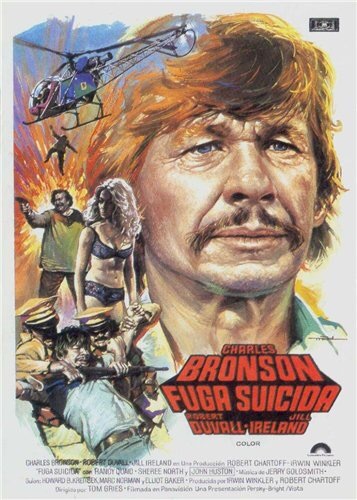 But there are a lot of lesser known gems to come out of the era, including this largely forgotten Charles Bronson masterpiece, Breakout. Chuck plays a slick talking dude willing to do “anything for money.” When Robert Duvall’s character is framed for murder and thrown in a Mexican jail by his uncle, his wife (real life Bronson wife Jill Ireland) hires Bronson to break him out. It’s not the most original plot, but the plot is almost incidental to giving Bronson a chance to really live up his character. He’s a good hearted guy who plays tough and can talk anyone into going along with his schemes. Including his hapless partner (a very young Randy Quaid) and his ex-girl friend’s cop husband. The movie is pretty deeply mired in the 70s, but in a great way. A well done soundtrack, unique characters, and Bronson’s mustache are all fun to watch, and the dialog is something you could never get away with in a modern film. But perhaps best of all, the movie follows none of the formulas so ubiquitous in films today, so while you could probably figure out the end if you want to, you can’t really be quite sure how it will play out. A lot of 70s films just don’t hold up well – Breakout isn’t one of them. It’s a delightful, funny, quirky movie you should watch if you get a chance.